A workbook for women with practical tips, tricks, and strategies for succeeding in the workplace. 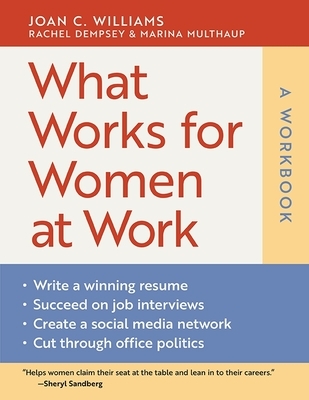 A companion to the highly successful What Works for Women at Work, this workbook offers women a hands-on guide filled with interactive exercises, self-diagnostic quizzes, and action-oriented strategies for building successful careers. The Workbook helps women understand their work environments and experiences and move up the professional ladder. Readers will discover the four patterns of gender bias--Prove-It-Again, the Tightrope, the Maternal Wall, and the Tug of War--and they can use the toolkit to learn how to navigate the ways these patterns affect their careers. Williams and her co-authors also introduce the new concept of "Gender Judo," which involves doing a masculine thing in a feminine way, in order to avoid a backlash. This interactive Workbook can help any working woman make better choices and offers specific advice on: - - How to write a winning resume - How to succeed on job interviews - How to negotiate salary - How to create a social media network - How to create work-life balance - How to cut through office politics In addition, the best-selling What Works for Women at Work is now available in paperback. This book has already helped thousands of working women successfully navigate gender bias in the workplace. Praised by numerous publications for offering an innovative, practical, and down-to-earth approach, What Works for Women at Work is still the go-to guide for working women. Chock full of insights, What Works for Women at Work: A Workbook will be an indispensable handbook for working women, providing the tools, the tips, and the tactics to get ahead.